These are one of our favourite types of beasts. Their impressive size matched with their gentle nature is a great combination. In the wild these guys hang out with the orang-utans in Borneo. They go through five moults in their life time getting bigger each time they shed their skin. The females are much larger than the males. This is because she has to produce a lot of eggs using her ovipositor to lay them in the ground. The smaller males with hitch a ride on the back of the female. He will guard her, fighting off any other males that try and take over. 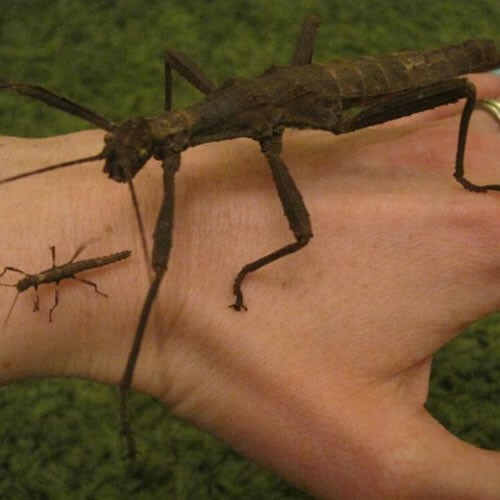 An incredible thing that they can do is reproduce without the need of a male stick insect. This is called Pathenogenisis, clever eh?